Potatoes provide the energy, high-quality carbohydrate, protein and potassium that can fuel optimal performance in athletes. Adequate energy intake supports optimal body functions and the increased demands of physical performance. A medium (5.3 ounce) skin-on potato contains 110 nutrient-dense calories. Carbohydrates are important for optimal mental and physical performance. Potatoes are a nutrient-dense carbohydrate, providing 26 grams of high-quality carbohydrate (per medium potato), helping to fuel the brain and muscles. 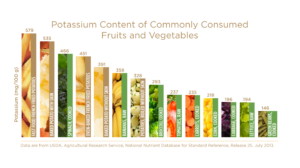 Potassium is an important electrolyte that aids in muscle, cardiovascular and nervous system function. A medium skin-on potato contains 620 milligrams of potassium, even more than a banana. To learn more about potatoes role in building a strong nutrition foundation for optimal performance in athletes click here.